The alpaca section of the Whangarei Show this year looks to be fantastic. With over 100 alpacas and a similar number of fleeces this will be a real spectacle. In Northland we have to be particularly aware of the needs of these beautiful animals. It can be very hot and humid so the alpacas need to be shorn in October or November. So the Whangarei show is slightly different because the huacaya alpacas have been shorn. 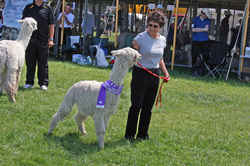 The alpacas are judged on Sunday 5th December so make sure you keep this date free. The Whangerei show is a fabulous rural show with lots of attractions for children and good stuff for the men (like BIG tractors).